Thought NiCad was dead? Guess again. 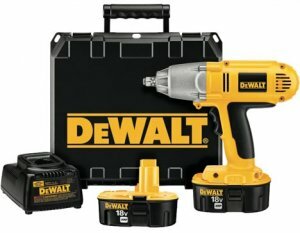 We knew DeWalt planned to support their 18-volt line for years down the road, but I just assumed that meant their 18-volt lithium-ion line. It turns out that is not the case at all, because DeWalt has just announced the new DW059HK-2 1/2-inch Impact Wrench that uses good old 18-volt NiCad technology. This should be good news for people with a stock of 18-volt DW batteries, and don't feel it is time to upgrade. "The DW059HK-2 complements the other tools in our 18 volt system and further demonstrates our commitment to providing contractors with products that meet the demands of professional jobsites," said Jeremy Torok, senior product manager, DEWALT. "While we are constantly looking to maximize technology and develop entirely new tool systems, we are also deeply committed to those users who rely on our existing 18 volt offerings. The introduction of our latest impact wrench is one way we are continuing to serve these contractors." The new Impact Wrench delivers 300 ft/lbs of torque at a maximum of 2,600 impacts per minute and 1650 revolutions per minute. It uses an impact mechanism that is said to direct torque to the fastener better without the kickback you would normally get with such a tool. The DW059HK-2 is built using a magnesium gear case, and all metal transmission for long life and durability. It uses a hog ring anvil system for easier socket changes. The new Impact Wrench can be purchased as a kit, which includes a 1-hour charger, 2 18-volt XRP NiCad batteries and tool case, and is expected to retail for $299. The Wrench can also be purchased tool-only and should retail for $159.